There are many aspects of Guards uniform on show here as well as special clothing for the climate. Two Colour-Sergeants are in full dress, the one on the left seems to have leather gaiters or short boots. There are three examples of the white drill jacket which was a descendant of the old white waistcoat that the Guards wore in the 18th century. Colour-Sergeant Short on the left, has the undress version of badges for his rank, the topmost being a crown, then crossed swords, then a grenade then 3 chevrons. This arrangement is still used today on khaki service dress. He has a peakless forage cap with a gold band around it. 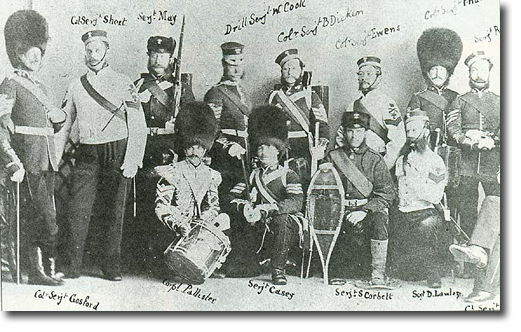 Corporals and privates had red bands. Drill Sergeant Cook, in the middle is the most senior there and has a peak on his cap. A Sergeant kneeling on the right (Lawless?) has a grenade over his stripes in undress while Sergeant Casey, in full dress kneeling in the middle, has only chevrons. He too seems to be wearing black leather gaiters. This man, and the man behind also show that the haversack strap was worn over the crimson sash. The special clothing for Canada included sealskin caps with ear flaps and a badge on the front. Two blanket were issued to each man, one to wrap around the shoulders and one to sew up into a bag to pull up over the legs, a sort of sleeping bag! There was much acquisition of non-regulation clothing to keep them warm.